The Morvern Peninsula, on the west coast of Scotland, is an isolated and stunningly beautiful part of the world. Because it is so peaceful and wild, you tend to think that probably not much has happened here in the past 1,000 years. But you couldn’t be more wrong. 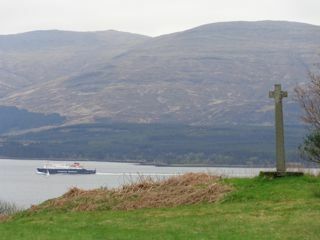 In the days when travel by water was the only effective method of getting from A to B, the Sound of Mull was a ‘motorway’ for vessels sailing up the west coast of Scotland – all the way back to the Vikings and beyond. 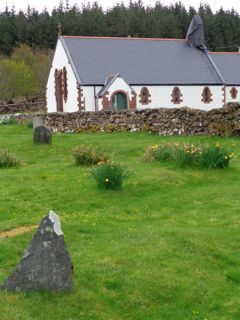 The present Kiel Church, which stands on a hill overlooking the Sound of Mull, is only just over 100 years old, but there has probably been a church on this site since the 6th Century. 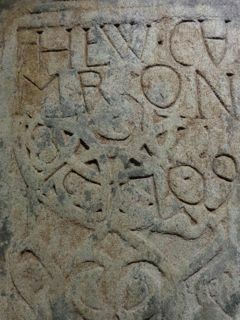 It’s even possible that St Columba himself, who died on Iona, might have visited here. I’m used to cemeteries being flat and ordered. That’s not the case with this graveyard. 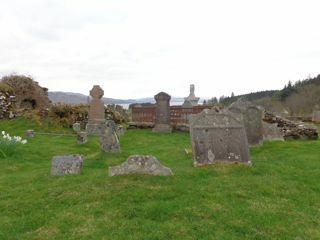 The ground is rough, the stones – mostly 18th and 19th century – laid out higgledy-piggledy, with many sinking into the ground, leaving only their tips visible. For such an isolated corner of the country, there’s a lot of interesting history to be found here. 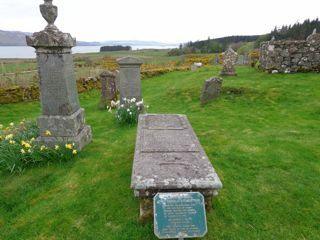 A marker has been placed by one monument, commemorating the grave of a soldier who carried a Jacobite banner on Culloden Field. To the side of the church, there is a tiny building which houses the beautiful Carved Stones of Kiel which date from the 14th, 15th and 16th centuries. 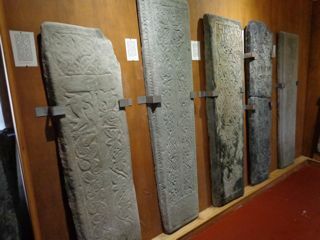 These too are gravestones, their size and intricate carving indicating the importance of the people whose graves they once belonged to. If you’re ever in this wonderful part of the world, please take the time to visit Kiel Church, its fascinating cemetery and carved Stones. 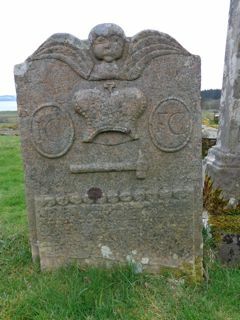 This entry was posted in History, Travel and tagged cemeteries, Culloden, graves, graveyards, Iona, Kiel Church, Lochaline, Morvern, Scotland, St Columba, The Carved Stones of Kiel. Bookmark the permalink.